Artists create an altered perception for us when they place their work on a hillside, in a valley, alongside a road or next to a building. Using shape, size, relative position and space, sculpture encourages us to observe the world we occupy in a whole new way. For over ten years, the Voigt Family Sculpture Foundation has supported exceptional artists, each of whom provides a new way of reflecting the world around us. The ten artists in this exhibition were selected for their extraordinary creativity and because they represent significant features the Voigt family has fostered with their commitment to providing exceptional public art throughout Sonoma County. Symmetry, a sense of balance and harmony, juxtaposition and colossal forms are qualities the Voigt family has believed in and continues to nurture. Roger Berry, Dee Briggs, Riis Burwell, Robert Ellison, Peter Forakis, Chuck Ginnever, Edwin Hamilton, Ned Kahn, Jann Nunn and Doug Unkrey represent a diverse and yet parallel exploration of geometry and space. Each one of these artists juxtaposes symmetry and asymmetry, order and chance, reason and randomness. Contrasting circular harmony with sharp, intersecting lines, Roger Berry’s musical circles use asymmetry to jolt our perspective. Dee Briggs’ two rings roll toward us with confidence, grace and elegance. Riis Burwell’s towering work intersects triangles, circles and ovals in random balance. Robert Ellison’s rectangular structure allows us to frame our visual terrain. Both Chuck Ginnever and Peter Forakis forge sheets of bronze and steel that bend like sheets of paper in a playful and yet formal manner. Through their eyes, we reshape our own personal landscape. Edwin Hamilton’s sensuous forms provide a contrast in colossal weight with voluptuousness. Ned Kahn’s choreographed web of armor, draped gracefully around the trees, encourages us to observe the interaction of wind with shimmering light. Jann Nunn’s circles within a circle invites us to stand inside and quietly contemplate the multiple conversations taking place amid the treetops. Doug Unkrey wants us to play with congruence, discord, color and equilibrium. All ten of these artists are able to work with composition, materials, harmony, balance, color, pattern and profound imagination. For more than ten years, the Voigt family has promoted an appreciation for sculpture in Sonoma County by providing over 100 pieces of public art. They have given artists support to create their dream sculptures with residencies, commissions and exhibitions. This work can be seen in Healdsburg, Geyserville, Petaluma, Cloverdale, and Santa Rosa making Sonoma County a destination for art lovers. As Roger Berry said, “The Voigt Family Sculpture Foundation has distinguished itself as a champion of sculpture and of the communities of Sonoma County. They allow artists to focus on art.” People who visit, live and work in Sonoma County, have been given the important gift of quality public sculpture that they are able to experience every day. This year represents the tenth year of exhibitions the Voigt family has sponsored at Paradise Ride Winery. Stroll the grounds of the beautiful Paradise Ridge landscape and as you walk around each piece, you will see it transform again and again, offering a different appearance from various points of view and places in time. 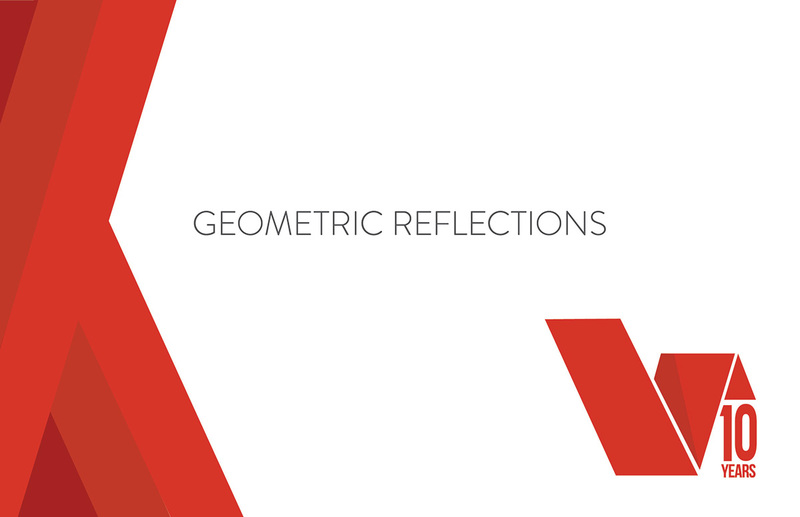 Enjoy the elements of geometric reflections and let the work astound you not only with beauty, but also a whole new way of seeing.